2012/01/23 - Omega the color of Valentine's Day ? Red gold ! For Valentine's Day, OMEGA offers you the element that has motivated explorers, mystified alchemists and, for you pragmatists, held its value for centuries in the color that boldly communicates the passion of true love. 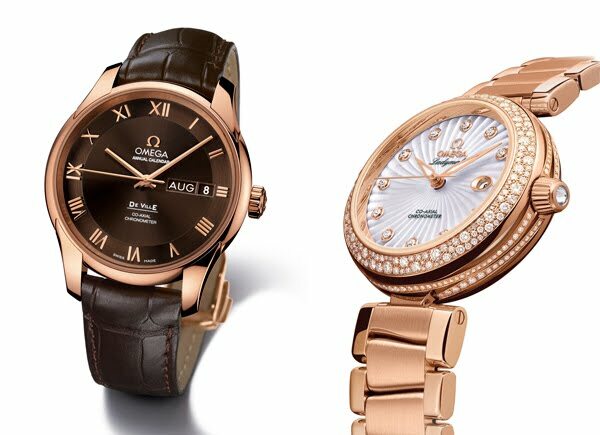 This year, OMEGA proposes timepieces in 18 Ct red gold: for women, a Ladymatic that has been enhanced with glittering diamonds; for gentlemen, a De Ville Annual Calendar. The OMEGA Ladymatic was introduced in late 2010 and since its release, it has been warmly received by women who are as impressed by what's inside the watch as they are by its timeless, elegant design. For Valentine's Day we are featuring an 18 Ct red gold Ladymatic with a bezel paved with full-cut snow-set diamonds. There are also full-cut diamonds on the waves that encircle the case. In fact, altogether, the watch sparkles with 368 diamonds whose combined weight is 1.72 carats. This dazzling Ladymatic is powered by OMEGA’s exclusive Co-Axial caliber 8521 equipped with a silicon balance spring and delivered with a four-year warranty. The OMEGA De Ville Annual Calendar defines classic styling. The 41 mm case in 18 Ct red gold has a brown leather strap; its brown dial is accented by 18 Ct red gold Roman numeral indexes and a month and date window at 3 o'clock. The movement inside the watch is worthy of this striking timepiece. It is an OMEGA Co-Axial caliber 8611 equipped with a silicon balance spring. With its annual calendar function, the date only has to be changed once a year, on the first of March. The central hour, minute and seconds hands are also crafted from 18 Ct red gold. The OMEGA De Ville Annual Calendar has a full four-year warranty. From all of us at OMEGA, happy Valentine's Day.